Many vertebrate animals expose humans to dangerous pathogens that have public-health significance. Other chapters deal with specific arthropods that transmit disease organisms to humans. This chapter deals with vertebrates that expose humans to disease organisms without benefit of an arthropod vector or that are primary reservoirs of organisms that cause important human disease. Included are domestic (house mouse, rat) and wild or sylvan rodents. These rodents can infect humans directly with diseases such as tularemia, leptospirosis, arenavirus, hantavirus, ratbite fever, lymphocytic choriomeningitis and salmonellosis (food poisoning). They also may serve as reservoirs for diseases transmitted by ectoparasites, such as tick-borne relapsing fever, Colorado tick fever, Rocky Mountain spotted fever, plague, murine typhus, rickettsial pox, Lyme disease, ehrlichiosis, babesiosis and tularemia. Birds, bats and small mammals can be carriers of rabies, histoplasmosis, listeriosis or leptospirosis. Commensal (domestic or urban) and sylvan (wild) rodents occasionally are targeted for control measures. These rodents not only have the potential to be annoying and to cause structural damage, but they also threaten human health. Three species of urban rodents, Mus musculus (house mouse), Rattus norvegicus (Norway rat) and Rattus rattus (roof rat), create the principal rodent problems. Rats. Two types of urban rats are broadly distributed, the Norway rat and the roof rat. The Norway rat (synonymous with brown, dump, barn, sewer, gray or wharf rat) is a burrowing rodent. 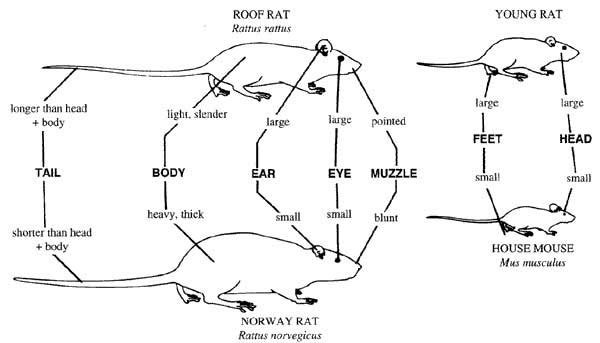 The Norway rat has a blunt muzzle, small eyes and short, close-set ears. Its fur is coarse and usually brownish- or reddish-gray, with whitish-gray hair on the belly. Its nearly naked, scaly tail is dark on the top and light on the underside and is shorter (6 to 8½ inches) than the combined length of the head and body (7 to 10 inches). Adults weigh 12 to 18 ounces. The feces are capsule-shaped and about 3/4 inch long. Norway rats can be found in warehouses, farm buildings, houses, sewers, rubbish dumps, woodpiles and building foundations. They are good climbers and can reach a distance of 13 inches while standing on the ground and jump 24 inches vertically. The Norway rat has relatively poor vision but keen senses of smell, touch, taste and hearing. The sense of touch is served by long whiskers on the snout. The home range is often 100 to 150 feet. Norway rats are mainly nocturnal, but they may be active in undisturbed places during the day. They feed on virtually anything edible. Urine. House mice urinate at intervals along well-used runways, occasionally creating small mounds (urinating pillars) that consist of a combination of grease, urine and dirt that fluoresces under ultraviolet (black) light. Smudges or rub marks. Dirt and oil from the fur of the rodent may sometimes leave smudge marks on pipes and beams. Smudge marks left by rats are much more conspicuous than those produced by house mice. Gnawing marks. Sawdustlike wood chips are produced by the gnawing of house mice and rats around baseboards, doors, windows and frames, and kitchen cabinets. Recent gnawings on wood are light in color, darkening with age. The size of the tooth marks left in the wood can help distinguish the presence of rats or mice. Droppings. The age of the droppings indicates whether the infestation is current. Old droppings are dry, gray and crumble easily when pressed. Fresh droppings are dark and moist. 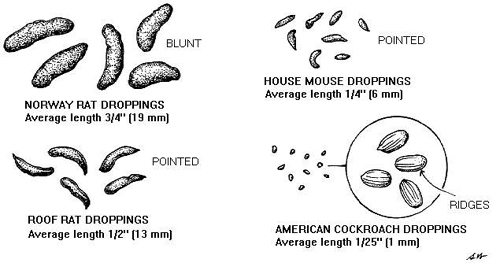 Droppings are most numerous along runways, near burrow entrances and at feeding sites. Pet excitement. Pawing and excitement of cats and dogs can indicate the presence of rodents. Pets respond most commonly when the premises have been invaded only recently. Odor. Rodents produce characteristic odors. With experience, the musky scent of house mice can be differentiated from those produced by rats. Runways. Rats and mice are creatures of habit and will travel the same pathways between their shelter, food and water sources. Outside these appear as packed earth paths; they are also evident in dense vegetation. Indoors, runways are usually along walls, under boards, behind stored objects and similar places. Tracks. Fresh tracks are distinct, old ones faint. Tracks are more easily seen by side illumination with a flashlight than by direct light from above. Tail drags, as well as footprints, may show up. A smooth patch of flour or talc laid down in a runway may show activity. External factors that indicate environmental potential for supporting rodent populations include the type and condition of the structure, refuse storage practices, amount of rubbish present, available cover and food supplies. Inspections of building interiors are made when rodent infestations are severe. When no rodent signs are detected, a site is usually assumed to be rodent-free or to harbor a low infestation. Medium-density populations are characterized by the presence of old droppings, gnawing and one or more sightings by flashlight at night but none during the day. High-density populations are indicated by daytime sightings, fresh droppings, tracks, active gnawing and multiple nighttime sightings. Rodent surveys should provide information on sanitation status, degree of infestation and factors favoring rodent population increase, and provide data for planning control programs. The data collected during post-control surveys are used to evaluate the effectiveness of the control program. In addition to rodent signs, accessibility of food and harborage indicates relative population potential and environmental factors favorable for rodent infestations. Trapping will determine the species present. Sanitation. Correction of sanitation deficiencies is basic in rodent control. Elimination of food sources through good sanitation practices is probably the best method of preventing an increase in rodent populations. Sanitation involves good housekeeping, including proper storage and handling of food materials and animal feeds. For example, store pet food in metal, rodent-proof containers. Properly store and regularly dispose of garbage and rubbish. Removal of commensal rodents should precede any extensive cleanup or environmental control since rats migrate quickly when food and shelter are removed, creating problems at other locations. In instances of plague or murine typhus, a program to control ectoparasites should precede or accompany rodent control, especially in urban or other densely populated areas and high-use recreational areas in the West. Exclusion. Prevention of initial invasion is primary. Blocking rodent access is a major factor in rodent control. Rodents can run along or climb electrical wires and cables, climb trees to gain entry to a building, climb almost any rough vertical surfaces such as wood, brick, concrete and weatherized sheet metal, crawl horizontally along pipes or conduit and gnaw through a wide variety of materials including lead, aluminum sheeting, wood, rubber, vinyl and concrete blocks. They can enter holes that are surprisingly small. Rats, for example, can gain entrance through openings larger than ½ inch square; mice require only ¼ inch. Conversely, they often enter buildings whose doors are left open for long periods. Heavy mesh hardware cloth, metal flashing and generally good construction are examples of mechanical barriers that can keep rodents out. To prevent rodent entry, seal holes with durable materials, screen ventilation openings and windows, install doors to fit tightly and use floor drains with metal grates (maximum opening, ¼ inch). Steel wool, lath screen and copper mesh are materials that can be packed tightly into holes to close openings or protect other areas from gnawing. Steel wool and copper mesh should be caulked over to seal them. Use materials such as mortar for concrete buildings. Hardware cloth (wire mesh), galvanized sheet metal, brick and aluminum of 22 gauge or thicker is recommended for flashing and covering holes or openings. Sewers are inhabited by Norway rats in some cities and towns. Rats may enter structures at sewer outlets and through manholes, catch basins, broken pipes or drains, and toilets. Because Norway rats are excellent swimmers, water traps do not impede their movement. The problem of rats in sewers is usually greatest in places where sanitary sewers are interconnected with storm sewers, thus providing multiple entry points. The domestic sewer of an average community provides enough food to sustain a large number of rats, a problem that has increased with the advent of garbage-disposal units. Regular elimination of harborage, such as debris removal and weed control, will reduce the amount of shelter available to rodents. Blackberry brush, for example, is a common harborage for rats. In some instances, a strip of heavy gravel placed adjacent to building foundations or other structures will reduce rodent burrowing at these locations. In any event, keeping the periphery of buildings and structures clean of weeds and debris (including stacked lumber, firewood and other stored materials) will discourage rat activity and will allow easier detection of rat signs. Commercial products should be stored on pallets at least 8 inches off the floor, 18 inches from adjacent walls, separated by an aisle at least 12 inches wide and not stacked more than 6 feet across. Within buildings, stairways, cabinets, lockers, machinery, double walls, false ceilings and floors, boxed-in pipes, and conduits may serve as shelter and nesting and breeding sites. Rodent damage to stored materials can be greatly reduced if good storage practices are followed to reduce harborage areas, permit inspection and cleaning, and allow for installation of appropriate control measures. Trapping. Trapping can be an effective method of controlling rodents, but it requires more skill and labor than most other methods. Trapping is recommended where poisons seem inadvisable and is the preferred method to try first in homes, garages and other small structures where only a few rodents may be present. Trapping has several advantages. It does not rely on inherently hazardous rodenticides, and it permits users to view their success. Also, it allows for disposal of carcasses, thereby avoiding odor problems from decomposing carcasses that could occur when poisoning is done inside buildings. Trigger traps are generally more effective than cage traps. Simple, inexpensive, wood-based snap traps are readily available. For rats, bait the traps with peanut butter, chocolate candy, dried fruit or a small piece of bacon tied securely to the trigger. For mice, use bacon, nuts, hard sugar-candy, gumdrops or peanut butter. Leaving traps untriggered until the bait has been taken at least once reduces the chance of rats or mice becoming trap-shy. Place traps close to walls, behind objects in dark corners and in other places where rat and mouse activity has been seen. Place them so that the rats and mice following their natural course of travel (usually close to a wall) will pass directly over the trigger. Traps can be set on ledges or on top of pallets of stored materials, if rodents are active in such locations. To determine whether rodents are present in a particular area, lightly dust the area with talcum powder. If rodents are present, their tracks will be visible in the dust. Cover all areas of escape with traps. Use enough traps to make the campaign short and decisive. Because mice seldom venture far from their shelter and food supply, traps should be placed 3 to 10 feet apart in areas where mouse activity is noted, and within 20 feet of each other for rats. Cage traps used for capturing rodents include steel traps, wire live traps and multiple-catch box traps such as the Ketch-All. These traps are designed to catch and hold one or more animals by means of a falling or sliding door, triggered when the rodent enters or nibbles at a bait. Effective trapping of commensal rodents depends on an understanding of basic behavioral traits. For example, Norway rats, while as agile as tree squirrels when necessary, are more at home on the ground and will normally be caught there, whereas roof rats are fond of climbing and can be taken more frequently from their runs along pipes and supporting beams. Mice are much more inquisitive than rats and will investigate a newly placed trap, whereas rats are apt to avoid it. Placement along observed rodent runs as indicated optimizes trapping probability. Traps should be revisited frequently. Intensive trapping for several weeks is recommended, leaving traps in place for at least five days before moving them to other locations. Traps should be placed so they will not endanger pets or children. Ketch-All type traps, wire live traps and snap traps designed only for mice are not considered dangerous, although they may bruise the fingers of a child. Larger snap traps and steel traps should not be placed in areas accessible to children unless they are placed in trap boxes. Glue boards. Glue boards are an alternative to traps and are good monitors for new incursions. They catch and hold mice and rats trying to cross them in much the same way that flypaper catches flies. Like traps, glue boards need to be placed along walls where mice and rats travel. They lose their effectiveness in dusty areas, and temperature extremes may affect the tackiness of the adhesive. Don't use them where children, pets or desirable wildlife can contact them. A disadvantage of glue boards is that the rodents are not killed instantly. Noise and electrical devices. Although rats and mice are easily frightened by strange and unfamiliar noises, they quickly become accustomed to regularly repeated sounds. Ultrasonic sounds, those above the range of human hearing, have very limited use in rodent control because they are directional, don't penetrate behind objects and lose their intensity with distance. There is little evidence that sound of any type will drive established mice or rats from buildings. Several types of electromagnetic devices have also been marketed with claims of repelling rodents effectively or causing them to behave abnormally. Scientific tests of many such devices have shown that they failed to control rodents as claimed by their advertising. Bait selection and placement. Anticoagulant baits are available as grain in a meal or pelleted form, or in plastic, cellophane or paper packets that keep them fresh and make placement easy. Rats and mice will readily gnaw into these bags to get at an acceptable bait. Baits are also available in paraffin blocks or extruded bait blocks that are used in sewers or where moisture may cause spoilage of other formulations, although acceptance of paraffin-block baits is usually less than with loose-grain baits. Extruded bait blocks have less wax than paraffin blocks and have better acceptance by rodents. Sodium salts of anticoagulants to be mixed with water are available for placement where water is scarce. Use of bait boxes protects rodenticides from weather and provides a safeguard to people, pets and other animals. Bait stations should have at least two openings, about 2½ inches in diameter for rats or 1 inch in diameter for mice, and be large enough to accommodate several rodents at one time. Like traps, bait boxes should be placed next to walls, with openings close to the wall. Rats usually feed in one place, so relatively few bait stations may be needed if correctly located. On the other hand, mice feed in many places and won't travel great distances. Many bait stations may be needed for mice. Space them no farther than 10 feet apart, and preferably closer. Baits need to be placed where mice are living, such as in wall spaces, on pallets of feed, etc. 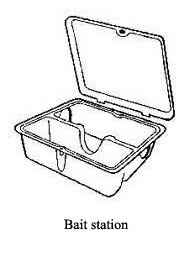 Bait boxes should be clearly labeled "Rat Bait" or "Mouse Bait," as the case may be. At each inspection, smooth the surface of the granular baits so that new signs of feeding will show readily. Examine paraffin- bait blocks for signs of rodent gnawing. Replace moldy, wet, caked or insect-infected baits with fresh ones. Highly toxic baits should be consumed in the bait box. Mice often carry food to other locations (called translocation). This can result in the bait being moved to an area that may endanger nontarget animals or contaminate food. Meal baits are less likely to be transported than pellet baits. Rodents have food preferences. Norway rats accept cereals, fruit, nuts, vegetables, meats and fish, but roof rats do not readily eat meat or fish. It is a good practice to pre-bait areas with nontoxic baits to make sure the rodents will take the bait. Then add toxicants to the type of bait that the rodents have already accepted. Make sure baits do not become rancid or unappetizing to the rodents, and keep them out of the reach of children, pets and other nontarget animals by using any of a variety of bait stations that are available on the market. Rodenticides. The major rodenticide group is the anticoagulants, which have a cumulative toxic effect on the rodents. Generally, repeated ingestion causes the animals' blood to lose its clotting ability and death occurs from internal bleeding, beginning about three to five days after first ingesting the bait. Because they are slow-acting, these compounds do not normally produce bait shyness. Most anticoagulant rodenticides require multiple feedings (chronic dose) to obtain a lethal dose. Some work after one or two feedings (acute dose). Multiple-dose anticoagulant rodenticides are generally considered much safer than the single-dose types. When anticoagulant rodenticides are used, fresh bait must be made available continuously for at least two weeks or until all signs of feeding cease. Single-dose rodenticides will give a quick knockdown of rat and mouse populations, and they may be preferred where the rodents are abundant or where it's hard to get them to accept a bait for several days in succession because of competing food items. When they consume a sublethal amount of an acute toxicant, bait shyness may result. Pre-baiting will largely prevent sublethal exposures and thus bait shyness. Because of this bait-rejection problem, such rodenticides shouldn't be used more than twice a year at a given location, and preferably only once. Some newer single-dose rodenticides do not produce symptoms until a lethal dose has been consumed. Therefore, bait shyness is not a problem. Anticoagulants have the same effect on nearly all warm-blooded animals, but sensitivity varies among species. If misused, anticoagulant rodenticides can be lethal to nontarget animals such as dogs, pigs and cats. Additionally, residues of anticoagulants present in the bodies of dead or dying rodents can cause toxic effects to scavengers and predators. In general, however, the potential secondary poisoning hazard from anticoagulants is relatively low. In the case of accidental ingestion of anticoagulants by humans or pets, vitamin K1 and/or blood transfusions are effective corrective treatments. These available treatments, as well as the toxicant's slow action, make most anticoagulant baits among the safest of rodenticides. Tracking powders. Toxicants mixed with a dust can be used to control rodents. The powder adheres to the rodents' feet and fur and is consumed during grooming. Powders are particularly useful for house mouse control, although they are also used for rat control. Most tracking powders incorporate anticoagulant rodenticides. When targeting sylvan rodents, accurate identification of the offending species is important. In a particular situation, the best control measure will depend on the species of rodent, location of the problem area, surrounding biological community, size and distribution of the pest population, etc. Fumigants. 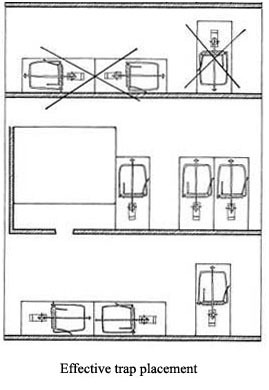 Fumigants are often used to control rodents in their burrows in outdoor situations, and sometimes in rail cars and on ships. Gassing outdoor burrows is an excellent means of control. Many of the rodents are killed underground so the problem with carcass disposal is reduced. Gas has an advantage over other formulations in that it destroys fleas, mites and other parasites, a factor of considerable importance in controlling the spread of some diseases. Special care should be taken to prevent the gas from reaching occupied buildings through the rat burrows. Fumigation of a building can be expensive if the structure has to be tarped. Because fumigants are highly toxic to people and animals, they must not be used in any situation that might expose the occupants to the vapors. The hazards involved with fumigants dictate that only people licensed for fumigation pest control should use fumigants in any situation involving buildings or other structural enclosures. Rodent competition. There is some competition between commensal rodents. Partial separation between rats and mice occurs, for example, in grain stacks where house mice feed in the lower areas and rats in upper portions. The smaller size of house mice gives them access to places that are not available to rats. Upon direct confrontation, rats will kill mice. When a building is freed of rats, house mice may move in or increase in numbers due to reduced competition or ability to enter and colonize areas that have been rat-proofed. House mice are highly competitive against deer mice, and where house mice are present, deer mice will rarely be found. Resistance to rodenticides. Genetically immune individual rodents that survive a rodenticide treatment may pass the resistance genome to their offspring. When a rodent population has a rather high number of individuals that are less susceptible to a rodenticide, resistance becomes a concern. The development of resistant rodent populations is related to the amount of selective pressure that is applied. As a result, more thorough rodent control programs can be expected to develop the greatest problems with resistance. Pest control operators should constantly be aware of resistance as a source of control failures. Where rodent control efforts are regularly applied, periodic shifting of baits with different active ingredients is advisable. Rodenticide safety precautions. Certain general safety precautions should be followed besides those appearing on the labels of products. Consider all rodenticides dangerous, and place baits where only rodents can get them. There are no known rodenticides that don't present some degree of hazard to animals other than rodents. People who formulate rodent baits for their own use should use extreme care in handling the materials and wear rubber gloves, an apron and a proper respirator. Wash thoroughly after preparing baits, using soap, a brush and plenty of water. Clean bait-mixing utensils thoroughly, and use them only for bait preparation. Whenever possible, it is best to buy prepared or ready-to-use baits to reduce risks involved in handling concentrated toxicants. Label all bait containers and stations clearly with appropriate warnings. Store unused bait and concentrates in a locked cabinet, out of reach of children or animals. Follow the label directions on all rodenticide products carefully. Pick up dead rats and mice after a poisoning program. Handle the carcasses with tongs or rubber gloves. Especially in hantavirus areas, spray rodent carcasses and traps with disinfectant and place the rodents in a plastic bag for disposal. Dispose of large numbers of rats and mice by incineration or burial. With only a few, especially mice, place them in a plastic bag, close it tightly and dispose of it with other refuse. Remove and destroy all uneaten bait at the end of the poisoning period. Do not leave single-dose baits exposed for more than three or four days. Health risks from birds are often exaggerated. Nevertheless, large populations of roosting birds may present risks of disease to people nearby. Food may be contaminated by birds, but this risk is usually limited to food manufacturing or processing plants. When parasite-infested birds leave roosts or nests to invade buildings, their parasites can bite, irritate or infest people. Serious health risks arise from disease organisms growing in accumulations of bird droppings, feathers and debris under a roost. If conditions are right, particularly if roosts have been active for years, disease organisms can grow in these rich nutrients. Histoplasmosis, a systemic fungal disease (mold), is transmitted to humans by airborne spores from soil contaminated by pigeon and starling droppings (and those of other birds and bats) for three years or more during which the disease organism (Histoplasma capsulatum) increases to significant levels. Although usually associated with soil, in rare instances the fungus has been found in droppings alone, such as in attics. Infection is by inhalation of the spores, which can be carried by wind, particularly after a roost has been disturbed. Infections are usually mild, producing either no symptoms or a minor, flulike illness. But the disease can, on occasion, lead to high fever, blood abnormalities, pneumonia and even death. Based on histoplasm in skin tests given to large numbers of people throughout the U.S., it is thought that about 50 million people have had histoplasmosis or have been exposed to it. Each year there are about 500,000 infections, 5,000 people hospitalized and 800 deaths in the U.S. due to histoplasmosis. Ocular histoplasmosis syndrome (OHS) results from infection by H. capsulatum. In this condition, the central part of the retina (the macula, used in straight-ahead vision) becomes inflamed and damaged when blood vessels grow inside the affected area. Four percent of those exposed to the disease are estimated to have tiny scars that put them at risk of developing OHS. An estimated 100,000 people have OHS in the rapidly progressive form that can lead to blindness. Cryptococcosis can result from pigeon droppings, which appear to be the most important source of the disease fungus, Cryptococcus neoformans. The fungus is typically found in accumulations of droppings in attics, cupolas, ledges, water towers, and other roosting and nesting sites on structures. It has been found in as much as 84 percent of samples taken from old roosts. Even when old and dry, bird droppings can be a significant source of infection. The disease is acquired by inhaling the yeastlike vegetative cells (2 to 3 microns) of the organism. There are two forms of cryptococcosis present in humans. A cutaneous form is characterized by acnelike skin eruptions or ulcers with nodules just under the skin. The generalized form begins with a lung infection and spreads to other areas of the body, particularly the central nervous system. It can be fatal. Like histoplasmosis, outbreaks of this disease often occur after building renovation, roost clean-up or other actions that disturb the old droppings. Other diseases carried or transmitted by birds affect humans to a lesser degree. Psittacosis, pigeon ornithosis and toxoplasmosis are normally mild in humans; however, serious illness or death can occur in rare cases. Pigeons and sparrows have also been implicated (along with many other species of birds) in outbreaks of encephalitis. Ectoparasites of pigeons, starlings and house sparrows can invade buildings. Some of these parasites bite and irritate humans. A long list of mites infests pigeons, but the northern fowl mite and chicken mite are usually the main culprits invading buildings from nesting and roosting sites. With very few exceptions, all birds are protected by one or more federal laws and regulations. Nontarget birds in treatment areas are protected, and any actions that kill or damage protected birds or their habitats are a violation of various federal and state regulations. Pigeons, starlings and house sparrows are not directly protected at the federal level, but applications of toxicants or repellents must be made according to the product label and under the restrictions that apply under the Federal Insecticide, Fungicide and Rodenticide Act (FIFRA). State and local regulations may require permits or restrict actions taken against pest birds. Pigeons. The domestic pigeon (Columba livia) developed from the rock doves of Europe and Asia and was introduced into the U.S. as a domestic bird. Rock doves originally nested in caves, holes and under overhanging rocks on cliffs, so they comfortably adapt to window ledges, roofs, eaves, steeples and other components of man-made structures. They have become the most serious bird pest associated with buildings, where they may congregate in large flocks. Although primarily seed or grain eaters, in urban areas pigeons feed on garbage, spilled grains, insects, food left by outdoor diners and food provided by bird lovers who intentionally feed pigeons. Pigeons are gregarious. Roosting sites, protected from the elements, are used for nesting, congregating at night and shelter in bad weather. Loafing sites are used by inactive birds during the daytime and may be located several miles away from feeding sites. When not feeding or mating, most of their day is spent cooing, preening and sunbathing. Pigeons prefer flat and smooth surfaces on which to rest and feed, and, unlike most birds, they will feed from rooftops, regardless of height, because they like openness that permits a speedy escape. Building roofs and ledges, cooling towers, bridges and signs are typical roosting and loafing sites. Feeding sites include parks, squares, food loading docks, garbage areas, railroad sidings, food plants and wherever people eat outdoors. Male pigeons are sexually mature at three to four months of age, females at six months. They mate for life unless separated by death or accident. After pairing and mating, nest construction begins in protected openings in or on buildings and structures. They share incubation responsibilities for the one or two eggs produced, the male from midmorning through afternoon and the female the rest of the day and evening. The young are able to fly after five weeks. Adult birds can mate again while the young are still in the nest. Pigeons nest during all seasons when conditions permit. City pigeons generally remain in one area year-round and can produce 10 young per year. Nests that are continually used become solid with droppings, feathers, debris and sometimes dead birds. Life span is highly variable, ranging from three to 15 years in urban roosts and up to 30 years in captivity. Starlings. European starlings were introduced into the U.S. in 1890, when 60 were brought to New York City and rapidly expanded into new areas. Today, 140 million starlings range throughout North America. Starlings are robin-sized birds that weigh about 3 ounces. They nest in holes or cavities in trees or rocks, in urban areas on buildings, in birdhouses, and on power stations, water towers and other structures. Starlings usually produce two broods a year with four to seven young per brood. Both parents build the nest, incubate the eggs and feed the young, which leave the nest when they are about three weeks old. Starlings migrate in some parts of the country. As cold weather begins in the fall, they begin forming larger flocks. The major sources of food shift from insects and fruits to grains, seeds, livestock rations and garbage. Rural and suburban roosting areas may shift into cities and towns. Each day they may fly up to 30 miles to their feeding sites. Each starling eats about an ounce of food daily. Leaving their roost at sunrise, they travel to feeding sites over well-established flight lines. Instead of flying straight into the roosts when returning just before sundown, they "stage" on high perches such as trees, power lines, bridges, and towers. The birds are quite social at these times and remain on pre-roost sites until after sunset, singing and calling to one another. Starlings are pests because of their high numbers. Thousands or tens of thousands can roost at one site. Droppings at the roost site damage car finishes, tarnish buildings, drop on people below, and build up to such levels that they become a health hazard; starlings have been responsible for outbreaks of a number of diseases. When starlings roost in food-processing plants or storage areas, they contaminate food. The birds are noisy, consume large quantities of livestock feed and contaminate water at stockyards. House sparrows. The house sparrow (Passer domesticus), also called the English sparrow, was introduced into the U.S. in the 1850s. Populations now flourish all over the continental U.S. except in heavy forests, mountains and deserts. Sparrows seem to prefer human-altered habitats in cities and around farm buildings and houses. While sparrows are still one of the most common birds, their numbers have fallen drastically since the 1920s when food and waste from horses furnished unlimited food. House sparrows average three broods per season with four to seven eggs per brood. Breeding can occur in any month throughout much of the country but is most common from March through August. Eggs are incubated for about two weeks, and the young stay in the nest another two weeks. Nests, bulky and roofed over, are located in trees and shrubs, on building ledges, in signs, on light fixtures and under bridges. The nests often plug rain gutters or jam power transformers. Sparrows are aggressive and social birds, often outcompeting native species. They have no recognized migration patterns and will stay in an area as long as food and nest sites are available. Young birds, however, move out of an area to establish new territories in flocks of juvenile birds and nonbreeding adults that may travel four or five miles from nest sites to feeding areas. Sparrows are very tolerant of human activity and will not hesitate to set up housekeeping in high-traffic areas. They feed preferentially on grain and also on fruits, seeds and garbage, and can be pests in many situations. Their droppings contaminate stored grain and bulk food. Droppings and feathers can make hazardous, unsanitary and smelly wastes inside and outside of buildings, on sidewalks and under roosting sites. Sparrows also can become pests when they nest inside a food plant, warehouse, mall or atrium. The birds cause damage by pecking at rigid foam insulation in buildings and nesting inside traffic lights. They create fire hazards by nesting in transformers and power stations. They are a factor in the transmission of a number of diseases, internal parasites and ectoparasites. Other birds. Other birds, from hawks to swallows, may occasionally cause unexpected and unusual pest problems or serve as reservoirs of disease organisms. When blackbirds and crows roost in suburban areas they become pests. Woodpeckers can "hammer" into house siding looking for insects. Seagulls can feed at food plants, landfills, etc. Many of these birds are more protected by laws and regulations than are the three species discussed previously. Inspection. Surveys should be conducted early in the morning, midday and again in the evening to construct an accurate account of the problem and the different activity periods in order to minimize risk. The survey should document both the target and nontarget species involved, census the target population and identify bird status as resident, migrant, adult or juvenile. An attempt should be made to identify the activity as feeding, roosting, nesting or loafing, determine sources of food and liquids, and estimate health and damage risks presented by their presence. To assess control options it is helpful to determine what attracts the birds to the site, what nontargets are resident, where they might disperse to and whether exclusion or habitat modification are viable options. Public relations and legal ramifications should not be overlooked. Habitat modification. Habitat modification for birds means limiting a bird's food, water or shelter, which for pigeons, starlings and house sparrows is not practical as these birds will have a number of feeding and watering sites often far from roosting and loafing areas. Where people are feeding birds in parks or lunch areas, education can help reduce this source of food; but in most cases people will pay little attention to requests to stop. Pigeons, but not sparrows or starlings, may be induced to move by the persistent destruction of nests and eggs. This can be accomplished by high-pressure hosing from fire- fighting equipment or other water lines. This is the most cost-effective method of nest destruction, effectively destroying the nest, eliminating ectoparasites, cleaning droppings and feathers from the nest site, and harassing the roosting birds. Use high-pressure sprays only where the high pressure or water will not damage buildings or equipment. Remove all droppings and nest materials from the area. To follow a more traditional method when spraying is not safe, use a hook fastened to a long pole to remove the nests. If nests are within 20 feet of occupied sites, treat the immediate nest area with an insecticide/acaricide to eliminate ectoparasites. Destroy nests every two weeks during the spring and summer months until the birds move to other nest sites. Exclusion. Some building designs and conditions lend themselves to bird infestation. Flat ledges, openings in water towers and vents, unscreened windows, and other attributes make a building an attractive location for roosting, nesting and loafing. Modification or repair can exclude birds. Typical solutions include replacing broken windows and screens, eliminating large crevices, and blocking openings into vents, cooling towers and roof-top equipment with hardware cloth. The following specific measures should be considered because the birds are not killed and the control is comparatively long-lasting. Spikes (porcupine wire, sharp metal spikes or any similar "bed of nails") can stop birds from roosting on ledges. Where they can be used, they usually work fairly well. If aesthetics are important, these devices can be limited to areas where they cannot be easily seen. If pigeons are likely to drop nest material and other debris on the newly installed spikes in an attempt to create a new roosting surface, install metal spikes on potential landing sites above the installation. Check every six months for accumulated debris or nest material, regularly remove leaves and other matter and ensure that no tree branches hang over protected ledges. Netting blocks access of birds to large roosting areas in structures, especially in warehouses and around mechanical equipment areas and cooling towers where aesthetics are of minor consideration. Knotted or extruded, UV-resistant plastic nets will last two to five years. Covers or ramps custom-designed for ledges, window air-conditioning units and roof edges keep birds from infesting these sites. This is costly but valid where limited application will keep birds off selected sites and where aesthetics are an important consideration. Sticky repellents. Tacky gels and liquids are designed to be sticky enough to make a bird uncomfortable, but not so sticky that the birds are trapped. The surface must be appropriately prepared to provide suitable service. After a few attempts, the birds stop trying to land on treated surfaces. Ultrasonic sound devices. These devices do not work against birds. Trapping. Trapping can be an effective supplemental control measure, especially against pigeons. Where a group of birds is roosting or feeding in a confined and isolated area, trapping should be considered the primary control tactic, preferably in the winter when food availability is at a minimum. Most pigeon-trapping programs use large walk-in traps (4 to 6 feet high) designed to be disassembled and moved, or low-profile traps (8 to 24 inches high). Traps are set in inconspicuous places where pigeons commonly roost or feed and where traps are not likely to be vandalized (a major risk in trapping programs). Baits of whole corn or sorghum are generally best, but wheat, milo, oat groats, millet, popcorn, sunflower seeds, peas, greens, bread or peanuts can be very effective. At the beginning of a program, scatter small quantities of bait and some decoys to start the birds feeding and determine the best trap sites. Because pigeons can fly great distances and find their way home, trap and release is not normally effective. In most cases, trapped birds should be humanely destroyed. Starlings are not usually good candidates for trapping programs, but effective sparrow traps are available. The sparrow funnel trap prevents sparrows from escaping after they have traveled through two funnels to reach a food bait. Fine cracked corn, millet, wheat or bread crumbs make good bait. Trap sites should be baited for a few days before trapping. Sparrow traps are usually more effective when placed on the ground. Nest-box traps attract a sparrow with a potential nest site. Once inside, the bird trips the mechanism, which dumps it into a collecting bag. This trap also works against starlings, as does the center drop trap, in which birds attracted by food drop through an opening and cannot escape. Avicides. Baiting with chemicals that have flock-alarming properties can control many species of birds using specific bait formulations (whole corn for pigeons, smaller grains for sparrows and other birds). Within 15 minutes of eating a toxic dose, birds become intoxicated. Most die within a few hours. Only 5 percent to 15 percent of the flock needs to be affected as the rest of the birds will become frightened, causing most to leave the area . Birds must be trained to feed on baits as they can be very wary under some circumstances. While baits are different for each bird, the general process is the same. For pigeons, place untreated whole corn in numerous small piles (¼ pound each, 20 feet apart) on flat rooftops, ledges and similar sites in the treatment area. An appropriate treatment would be 20 piles of bait on a flat 5,000-square-foot roof. The goal in pre-baiting is to get at least 40 percent of the birds to accept the untreated bait. Expect the effort to take from three days to three weeks. When possible, remove all untreated pre-bait corn before switching over to treated bait. Cardinals, blue jays, doves and certain other seed-eating birds also eat whole corn. Do not use these treatments where nontarget birds fed on the pre-bait unless the site is one of many. When this happens, continue baiting the isolated site with untreated corn. In this way, nontargets will be kept away from the treated bait sites. The higher the proportion of treated bait in the mixture, the better the chance to move the flock quickly. However, this also increases the number and visibility of impacted birds. With good bait acceptance, a ratio of 1:29 (treated:untreated) will generally kill about 5 percent of the flock; a 1:9 blend will generally kill 15 percent or more. Use the ratio that best fits the job. The objective is to relocate the flock, not kill every pigeon. The amount of treated bait set out should be about half the total pre-bait used each day. For example, if 8 pounds of pre-bait have been set out each day for a flock of about 100 birds, 4 pounds of the treated blended bait should be set out when switched over. One application is adequate for most jobs. At large commercial operations (e.g., a freight yard), daily bait placement may be required for a few days. If pigeons become bait-shy, wait about three weeks, then begin a new pre-baiting program. If a site has been getting monthly maintenance baiting, pigeons can become extremely bait-shy. Pre-baiting for as long as three or four months may be necessary, so it is usually best to switch to another control method. Use care to follow directions for using chemicals specifically for each species of pest bird. Read the label carefully. Secondary poisoning, in its classical definition, may be a risk if the chemical is not metabolically changed in the tissue of affected birds. If a dead or dying bird has a supply of treated bait in its crop there is potential risk to an animal feeding on this bird. Birds have poorly developed senses of taste and smell. Thus, in selecting and choosing foods, they rely heavily on previous experience, familiarity with the food and the sense of sight. Therefore, birds tend to reject new and different food. Consequently, the best bait is a food (fresh) the birds are accustomed to consuming. For example, if starlings are accustomed to feeding on food scraps at a dump, cracked corn is a poor bait selection. Conversely, if starlings are accustomed to feeding on cracked corn in and around a mill, food scraps may not be readily accepted. Placement should be on a site where the birds are accustomed to feeding — if safe and practical. Place in a natural manner, scattered rather than containerized or piled. Place baits at a time when the birds cannot observe the baiting activity, or if not possible, use the same person and routine each time. Pre-bait when unfamiliar food or a container is used and when a fast-acting poison is used. Note that a degree of selectivity can be achieved by choosing the proper bait. For example, whole kernel corn when used as bait will greatly reduce the hazard to small sparrowlike birds, providing, of course, that there are not kernel fragments in the whole kernel corn. Or, as another example, the use of meat scraps or bread as a bait may reduce the hazard to seed-eating birds. The careful selection of a bait site can also be used to achieve some degree of selectivity. For example, the baiting of sparrows inside a structure poses a hazard to no other birds. Sometimes the baiting of flat roof-tops for pigeons can be used to reduce the hazard to nontarget birds. Chemosterilants. Often called "birth control pills," these are used to control pigeons by inhibition of ovulation in the female and sperm production in the male. The effects of treatment can last for six months in the female and three months in the male. When applied as directed on the label, these materials will not kill birds, but populations will slowly decline over the years from the natural mortality in an aging pigeon population. Applications for 10 days two times per year, in the early spring (March) and again in late summer or early fall, are recommended. Pre-baiting with whole corn for a week will usually be necessary to achieve bait acceptance. Most birds eating chemosterilants will be temporarily sterilized, so care must be taken to avoid feeding nontarget species. Research data indicate little or no activity in mammals with labeled materials and no secondary poisoning hazard. Shooting. A possible alternative or supplemental method for eliminating birds is shooting with air-powered pellet guns. Shoot at night or first thing in the morning in roosting areas with a high-powered pellet gun, which is relatively accurate, quiet and short-ranged and will not cause structural damage. Nontarget risk. Most lethal tactics in bird control pose some risk to nontarget birds, as well as other animals. Nontargets are protected by various federal, state, and local regulations, as well as by public opinion. Minimize the threat by first identifying the nontargets in the area, using tactics that are least risky and monitoring operations to be sure that no nontargets are being adversely affected. Public relations. People often react more negatively to one dying bird than to accumulated pigeon droppings on sidewalks or potential risks of parasites and disease from bird roosts. Pigeons and sparrows are seen as pets rather than pests. The public's perception of bird-management operations needs to be considered. All bird-management programs should put some effort into avoiding "people problems" — particularly when using toxic control techniques. Bird droppings removal and cleanup. Workers removing large quantities of bird droppings should follow certain precautions to minimize risk from disease organisms in the droppings. Wear a respirator that can filter particles down to 0.3 microns and disposable protective gloves, hat, coveralls and boots. Wet the droppings to keep spores from becoming airborne, and keep wet. Put the droppings into sealed plastic garbage bags and wet down the outside of the bags. When finished, and while still wearing the respirator, remove the protective clothing and place it in a plastic bag. Dispose of trash bags (disposal should be permissible through standard trash pick-up). Wash up or shower. Other animals (such as skunks, raccoons, opossums and, in Hawaii, mongooses) become pests when they wander into residential areas from nearby wild areas or parks. Some have taken to living along with people — next to or sometimes inside buildings. These pests must sometimes be controlled. Because they are often game animals or are otherwise protected, most control actions will be nonlethal. As the only true flying mammals, bats are unique in the animal kingdom. A thin membrane of skin stretches from the long modified front legs to the back legs and then to the tail. The bones in the bat's "fingers" are greatly elongated and support the wings. Bats in the U.S. are almost always beneficial, as many bats feed on insects. In the Southwest, some species pollinate cactus. Many species have protected status. Those that most often become a problem live in colonies or groups, such as little brown bats and big brown bats. These species sometimes hibernate or roost inside buildings in attics, wall and ceiling voids, belfries, chimneys, unused furnaces and the like. The bats' droppings and urine can cause a foul odor and stain walls and ceilings. Their squeaking and scrambling noises can be intolerable to residents. Bats are associated with a few diseases that affect people, rabies and histoplasmosis being the most serious. Rabies is a dangerous, fatal disease. Random sampling of bats (healthy and ill) indicates an overall infection rate of less than 1 percent. By far, raccoons account for the largest percentage of animal rabies cases reported. But most of the recent human rabies cases in the U. S. have been caused by rabies virus from bats. This has been attributed to failure to seek medical attention after a bat bite or being unaware of a bite (for example, awakening to find a bat in the room but no obvious bite wound). Because most bats will try to bite when handled, they should be picked up with heavy gloves, forceps or a stick. If a bat has bitten someone, it should be captured without crushing its head, refrigerated (not frozen) and taken to the local health department for testing. If the bat cannot be captured, rabies prophylaxis should be initiated after consultation with a physician and the local health department. Controlling rabies in bats by programs designed to reduce bat populations is neither feasible nor desirable. Instead, bats should be excluded from houses and adjacent structures to prevent direct association with humans. The incidence of histoplasmosis being transmitted from bat droppings to humans is not thought to be high, but when working in bat roosting sites wear a respirator and protective clothing, and follow the safety procedures outlined for birds. During warm weather, bats feed by echolocation on flying insects in late afternoon, evening and early morning, but they are not active in bright daylight unless disturbed in the resting place or sick. When not in flight, they rest in dark hiding and roosting sites, e.g., caves, buildings and hollow trees. Bats are able to enter these places of refuge through holes as small as inch in diameter. In much of the country, bats migrate or hibernate when the weather turns cold, sometimes by hanging in clusters inside buildings. Depending on the species and geographic location, they breed from late spring to midsummer, giving birth to only one or two young. Young bats grow rapidly and can fly three to seven weeks after birth. Detection and control. Bats can squeeze through small openings and thus can use secluded harborage readily. Detection may depend on location of entry or exit points. In buildings, look for loose flashing, vents, shingles and siding; or damage and openings under eaves and soffits; at cornices, louvers and doors; by chimneys and windows; and anywhere pipes or wiring enter. Notice droppings under openings, smudges around holes and odors. The best time to observe the bats and pinpoint major exit and entry points is usually near twilight as they leave to feed. Watch roof areas and listen for squeaking at the exits just prior to flight. They may not come out during inclement weather. Roosts can be in attics, unused rooms, chimneys, vents, inside walls, behind shutters, etc. Bang on the walls and listen for squeaks and scratches as roosting bats are disturbed. Look for bat droppings, which will be found below roosting bats. They look like mouse droppings, except they contain wings, legs and other body parts of insects and often accumulate to a depth of several inches or more. Bat odor can be detected in large roosts as rotting droppings and bat urine have a very pungent and penetrating odor, musky and sweet. No pesticides are currently registered for bat control by the EPA, therefore exclusion is the recommended method for getting rid of bats. Bat-proofing a building usually requires closure of all upper openings 3/8 inch or larger. Complicating the process is the need to be certain there are no bats inside before sealing the building. June and July are peak months for bat complaints in much of the country. Unfortunately, that is the worst time of the year for control because they are rearing young in their colonies. The young cannot fly, so bat-proofing during this period will trap the young bats inside, where they will die. They may also crawl and flutter into living areas. The best time to bat-proof a building is either in late fall after bats have left for hibernation or in late winter and early spring before the bats arrive. If bat-proofing must be done in summer, it should be done after mid-August. Seal all but one or two principal openings and hang bird netting over the remaining exits to act as a "bat valve." This allows the bats to leave but not to return. Wait three to five days to make sure that there are no bats remaining in the roost before permanently sealing the remaining exits. Standard bat-proofing materials include ¼-inch hardware cloth, screening, sheet metal, caulking, expanding polyurethane foam, steel wool and duct tape — the same things used for rodent-proofing although bats don't chew and the durability standards can be reduced. Large sections of plastic bird netting can be draped over the roof areas of old buildings to keep out bats at a reasonable cost. Bright lights can repel bats. On commercial buildings, floodlights can be pointed at bat entry points to keep them from entering (the same lights may attract insects, which are the bats' food). Attics can be illuminated with four or more bulbs. Ensure that all corners of the attic are illuminated. Ultrasonic devices do not repel bats, but drafts of cool air from fans and air conditioners have, on occasion, kept bats from roosting in a poorly sealed attic. When a single bat finds its way into a home, office or store, it will usually find its way out again. When it does not, capture the bat with an insect net or in a coffee can. Always wear leather work gloves before attempting to capture the bat. If certain that no human or pet exposure has occurred, the bat can be released outdoors away from people and pets. If the possibility of exposure cannot be ruled out, contact the local health department or animal control to arrange for testing. Many species (Sciurus spp.) of tree squirrel have adapted well to suburban and city life. Occasionally, these squirrels enter buildings and cause damage or disturbance. The most common species that become pests are the gray squirrel, red squirrel, flying squirrel and fox squirrel. Tree squirrels usually build their nests in trees, but they also may store food and find shelter in attics and garages. Probably the primary way squirrels become pests is by scrambling and scratching inside attics and in wall voids. They may travel on power lines and short out transformers. They like to gnaw on wires. Some species have been found to harbor West Nile virus. The legal status of squirrels varies greatly with geographic area and species. Many are classified as game animals. Some are protected. Control and management. The first step in eliminating a squirrel problem in a building is to find out where the squirrels are entering. Common points of daily entry include damaged attic louvers, ventilators, soffits, joints of siding, knotholes, openings where utility wires or pipes enter, chimneys and flashing. Squirrels may gnaw directly through siding and shingles, too. Use heavy-gauge ½-inch hardware cloth or sheet metal to seal most openings. Make other suitable repairs as for rat proofing. Squirrels can be stopped from traveling on wires by installing 2-foot sections of 2- to 3-inch diameter plastic pipe. Split the pipe lengthwise, spread the opening apart and place it over the wire. The pipe will rotate on the wire and the squirrel will tumble off. (Be careful near high-voltage wires.) Squirrels often use overhanging branches as highways to rooftops. Tree branches should be trimmed back 10 feet from the building. If the branches can't be trimmed, a 2-foot-wide band of metal fastened around a tree 6 to 8 feet off the ground keeps squirrels from climbing up the tree and jumping to the building. There is at least one sticky repellent product for squirrels, similar to those used in bird control, that is applied to ledges, gutters, windowsills and the like to keep squirrels off. Live trapping with box or wire traps can be used to remove one or a few squirrels from a building. Traps should be left open and unset for a few days, surrounded by bait, so that the squirrels get used to them. Good baits include peanuts, nutmeats, peanut butter, whole corn, sunflower seeds or rolled oats. Then the traps can be set. Good trap locations include the roof, the base of nearby trees or in the attic itself. Squirrels are nasty biters and should be handled carefully. Experts differ on whether squirrels should be released or killed because of the possible transfer of disease. If they are released, do so at least 5 miles away in unpopulated areas so that they do not return. Where lethal control is permitted, rat snap traps can be used to kill squirrels in attics. The bait should be tied to the trigger and the trap nailed or wired to a beam. A number of species of ground squirrels and chipmunks occasionally become pests in and around buildings. Although the major concern is burrows around foundations, in lawns, on golf courses and in gardens, ground squirrels can transmit diseases such as tularemia and plague (in the West) to humans, particularly when populations are dense. Ground squirrels can have extensive burrows with large mounds, especially along roads and ditch banks. On occasion, burrows beneath buildings and in earthen dams, dikes and levees cause structural damage. Both ground squirrels (Spermophilus spp.) and chipmunks (Tamias spp.) are active during the day and are easily seen when foraging. But they spend much of their time in their burrows. In winter, most ground squirrels and chipmunks go underground and stay inactive. In some areas, ground squirrels will go into a summer hibernation when temperatures are high. Ground squirrels are primarily vegetarians, feeding on grasses. When vegetation dries up, they switch to seeds, grains and nuts. Chipmunks eat both plant and animal material, from seeds, nuts, insects and worms to songbirds and frogs. Control and management. Ground squirrel control is usually required only in severe infestations. To be effective, the correct identification of the species is important. Alter the habitat, if possible, to make the area less attractive to the squirrels. Use the most appropriate control method and establish an inspection or monitoring program to detect reinfestation. Ground squirrels are generally found in open areas, but they usually need some kind of cover to survive. Removing brush piles, wood piles and debris will make the area less attractive to the squirrels and will facilitate detection of burrows and improve access during the control program. Trapping is a practical means of controlling ground squirrels in limited areas where numbers are small. Live traps are effective but present the problem of disposal of a live squirrel. Because squirrels can carry disease, check state and local laws regarding their release at some new location. For the smaller species, rat snap traps can be effective. Place traps near burrow entrances or runs and bait with nuts, oats, barley or melon rind. Place traps under a box if any nontargets might be killed in the trap. Rodenticides are the most cost-effective way of controlling large populations of ground squirrels. A number of products are registered for this use. Grain baits are most effective when squirrels are feeding on grains and seeds. Place rodenticides in the burrows or in protected bait stations according to the label directions. Ground squirrels can also be killed by gassing their burrows. Spring is normally considered to be the best time for burrow fumigation. Fumigation is most effective when soil moisture is high; moisture helps seal the tiny cracks in the burrow walls. Fumigation is not effective during periods of hibernation because the squirrels plug their burrows. Fumigation is not a good choice adjacent to buildings because of the risk that the fumigant gas could find its way into the structure. Only rarely do chipmunks become a serious pest problem. In most cases, lethal control is unnecessary. Simply altering the habitat may cause the chipmunks to move. Exclusion methods may effectively chipmunk-proof the building. Remove objects such as logs, stones and debris close to a structure that may provide an attractive den environment. Live trapping and relocating chipmunks (where permitted) is considered a humane method of control. Effective baits include peanut butter, nuts, sunflower seeds, oats, bacon and apple slices. Relocation should be done into remote forest areas at least 5 miles from the trap site. Rat snap traps can also be used effectively. Traps should be placed at den entrances and baited with apple slices or perhaps with some peanut butter. Seeds and nuts should not be used because they will attract ground-dwelling birds. Poison baits that are labeled for chipmunk control can be used as described for ground squirrels. Because chipmunk burrows are long, difficult to find and often near buildings, burrow fumigation is not usually a recommended control tactic. These vertebrates are considered together because they are similar pests with similar management and control recommendations. Management of these animals almost always involves exclusion and/or live trapping. Skunks (Mephitis spp.) are nocturnal. They do not hibernate but may sleep through cold weather periods. They usually live in underground burrows, hollow logs or rock piles. They may decide to live under houses, decks, sheds, cabins or storage buildings. The main problem with skunks is their odor. They become pests when they change their dietary selections from rodents, insects and wild fruit to garden crops, garbage and lawn insects, moving closer to humans. Another major problem in some areas of the country is the transmission of rabies and skunks' documented involvement with West Nile virus. Raccoons (Procyon lotor) are common throughout North America. They are easy to recognize with their black face mask and ringed, bushy tail. They have long, thick fur with a thin muzzle and pointed ears. Their feet are well-adapted to climbing. They are large animals, weighing between 10 and 25 pounds. Their senses of hearing, sight and touch are well-developed, while those of taste and smell are not. They are commonly found near streams, lakes and swamps, and they often do quite well in suburban areas and even in city parks. Raccoons make dens inside hollow trees or logs, rock crevices, deserted buildings, culverts, storm sewers, chimneys, attics and crawlspaces. More than one den may be used. Mostly active at night, raccoons may be seen at dawn or dusk and sometimes even in the middle of the day. They may be encountered at latrine and picnic sites. Winter months are spent in the den, but they do not hibernate. They may become active during warm spells. Raccoons feed on animals and plants. In the spring and summer, they feed on crayfish, mussels, frogs, and fish. In the fall, they switch to fruits, seeds, nuts, grains and pet foods. They also eat mice, squirrels, and birds, and are quite happy knocking over a garbage can. Raccoons can transmit rabies. West Nile virus has been detected in raccoons. Opossums, which are related to kangaroos, are the only North American marsupials. The opossum is a whitish or grayish animal the size of a house cat with a naked, ratlike tail. Its face is long and pointed with rounded, hairless ears. It grows up to 40 inches long and can weigh up to 14 pounds. The average is 6 to 7 pounds for males and 4 pounds for females. Opossum tracks look as if they were made by little human or monkey hands. Opossums prefer to live near streams or swamps. They make dens in the burrows of other large animals, tree cavities and brush piles, and under sheds and buildings. Occasionally, they move into attics and garages. They eat nearly everything, from insects to carrion, fruits to grains, and garbage to pet food. Opossums are active at night. Their mating season is January to July, and they may raise two to three litters per year. Most young die in their first year. Those that survive may live up to seven years, but the average life is about 1.5 years. Opossums move slowly. Their top speed is about 7 miles per hour. When threatened, opossums climb trees or go down into burrows. If cornered, they may growl, hiss, bite, screech and exude a smelly green fluid from their rear end. If these defenses aren't successful, they may play dead. They have the reputation of being stupid, but scientists consider them to be smarter than domestic dogs. The main complaint against opossums is that they get into garbage, bird feeders or pet food left outside. Mongooses (Herpestes auropunctatus) are found on all the major islands of Hawaii except Kauai and extend from sea level to 10,000-foot elevations. Females usually produce two litters of two between February and November. Mongooses forage only during the day, primarily on small animals and insects, but they are omnivorous and will eat whatever is available or travel up to a mile to get food. They dig up lawns for grubs and enter homes to get at garbage-filled trash bags. Control and management. These animals can be prevented from entering buildings by repairing breaks in foundations and screening crawlspace vents with hardware cloth. If the animal is currently living under the building, seal all openings but one, then sprinkle a tracking patch of talc at the opening. Examine the area after dark. If tracks show that the animal has left, close this last opening immediately. Seal attic openings and cap chimneys with a wire cage or other animal-proof cover. When excluding animals in spring or early summer, be aware that young may also be present. Be sure that all animals have been removed before sealing the building. Otherwise, a serious odor problem from a dead animal could result. The best way to remove animals from around buildings is to trap them, with the exception of the mongoose, which may take months. Know your state and local regulations before releasing a trapped animal. Some areas prohibit releasing trapped animals, especially skunks and raccoons, because they carry rabies. State fish and game laws may also regulate the capture and release of some of these animals. If the animal must be killed, follow all appropriate regulations. If the animal is to be released, do it far away from human dwellings. Use what you have learned about the biology of the animal to find a suitable habitat. The release site for these large animals should be more than 10 miles away. Remember to check state and local regulations. Set traps as close to the den as possible or place them where damage is occurring, for example, at corners of gardens, breaks in stone walls or along obvious animal trails. Set multiple traps in a number of locations. Since these animals are active at night, check traps at least every morning, preferably twice a day. Check traps often to spot and release nontarget animals. There is obviously a special problem when trapping skunks. Skunks don't like to "shoot" if they can't see their target, so cover all but the trap entrance with burlap or canvas before placing the trap, or use a commercial skunk trap. Approach the trap slowly and transport it gently. To release a trapped skunk, stand more than 20 feet away and release the trap door using a string or fishing line. The best baits for skunks are chicken parts and entrails, fresh fish, cat food, sardines and eggs; for raccoon, chicken parts and entrails, corn, fresh fish and sardines; for opossum, apple slices, chicken parts and entrails, fresh fish and sardines. The best preventive measure for skunks, raccoons, opossums and mongooses is to establish a good level of sanitation in a neighborhood. Remind clients that released vertebrates must fight their way into new territory to establish themselves and that overcrowded habitat results in increased risk of disease and marginal resting sites. Prevention is the most humane way of managing vertebrate pests. Most snakes are nonpoisonous, harmless and beneficial. But few people want them in their homes. In general, a poisonous snake has a large triangular head, a pit between the eye and nostril, and vertical, elliptical pupils. It may also have rattles on its tail and noticeable fangs. When unsure, assume that the snake may be poisonous. Snakes are predators. Depending on the species, their diet may include insects, rodents, frogs, birds, worms, or toads. Some snakes hibernate in dens during the winter, sometimes under houses. At certain times of the year, they may enter buildings for warmth, shade or moisture, or in search of prey. When managing a snake problem, keep in mind that the snake may be a protected species. Control and management. If snakes are a regular problem, the best solution is to eliminate snake hiding places. Clean up brush piles, woodpiles, rock piles and other debris. Keep shrubbery away from foundations and cut high grass. Often, snake problems follow rodent problems. Eliminate the rodents and the snakes will move elsewhere. Eliminate rodent food and harborage. Mow grass short to expose rodent runs. Snakes often enter structures through broken block foundations, cracked mortar and damaged vents. These should be repaired. In a rattlesnake-infested area, a snake-proof fence can be installed around a back yard or play area by burying galvanized 36-inch-wide, ¬-inch-mesh hardware cloth 6 inches in the ground, slanted outward at a 30-degree angle. Keep all vegetation away from the fence. If a snake gets into a house or other building, several methods are available to remove it. Place damp burlap sacks on the floor and cover them with dry sacks. Check them every few hours to see if the snake has crawled underneath. The snake and bags can be lifted with a shovel and taken outside. Rat glue boards will capture all but the largest snakes. The glue boards should be tied down or attached to a plywood base. Place the glue boards along wall and floor junctions. Captured snakes may be killed or released. Before release, pour vegetable oil over the snake and glue to loosen it. Expanded trigger rat traps set in pairs along wall and floor junctions can kill smaller snakes.